The RCMP is hunting a GTA drug trafficker after 9 kg of cocaine was found in an airplane bathroom after the flight landed at Pearson International Airport. The incident occurred on Dec. 20, when border services officers searched a flight arriving from the Dominican Republic. 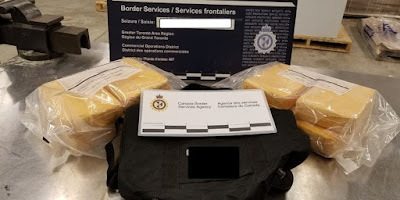 CBSA officers at Pearson made 131 seizures of cocaine last year, weighing in at nearly 900 kilograms.